No one needs to remind local residents that they live in the middle of a desert or that for the past 17 years Southern Nevada has experienced a severe drought. Anyone who has journeyed to Lake Mead has seen the prominent “bathtub ring” showing how much the water level has fallen. (Hali Bernstein Saylor/Boulder City Review) Klaus Herbert, survey manager for Barnard Construction Co., the general contractor working on Southern Nevada Water Authority's low level pumping station at Lake Mead, takes measurements Tuesday, Nov. 27, in preparation for wrapping up work in the underground cave and flooding it. 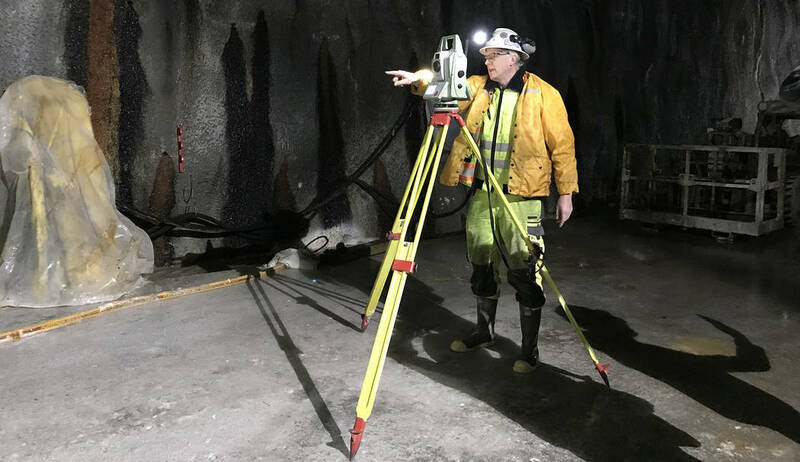 (Hali Bernstein Saylor/Boulder City Review) A cave, or forebay, 500 feet underground is part of Southern Nevada Water Authority's low level pumping station at Lake Mead. Pumps currently remove about 500 gallons of water per minute from the area, seen Tuesday, Nov. 27, 2018, which is expected to be flooded next week. (Hali Bernstein Saylor/Boulder City Review) Crews are lowered by crane Tuesday, Nov. 27, 2018, through an access shaft to a cave 500 feet underground to work on Southern Nevada Water Authority's low level pumping station at Lake Mead. 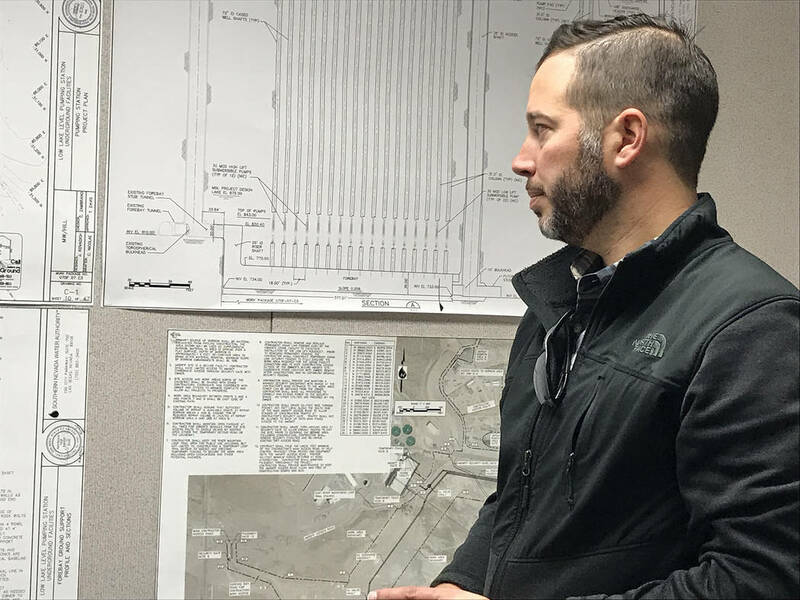 (Hali Bernstein Saylor/Boulder City Review) Jordan Hoover, project manager for Barnard Construction Co., general contractor for Southern Nevada Water Authority's low level pumping station at Lake Mead, discusses the scope of the project during a tour of the underground cavern that will connect to an intake tunnel Tuesday, Nov. 27, 2018. Without water the area’s economy would wither and the parched land would fail to sustain the existing population. Conservation has lessened the drought’s impact but is just one part of Southern Nevada Water Authority’s solution to ensure people have enough water. Another key component is new infrastructure, including a third intake tunnel — often referred to as the third straw — and a low level pumping station. The third intake, in operation since 2015, draws cooler, cleaner water from deeper within the lake. 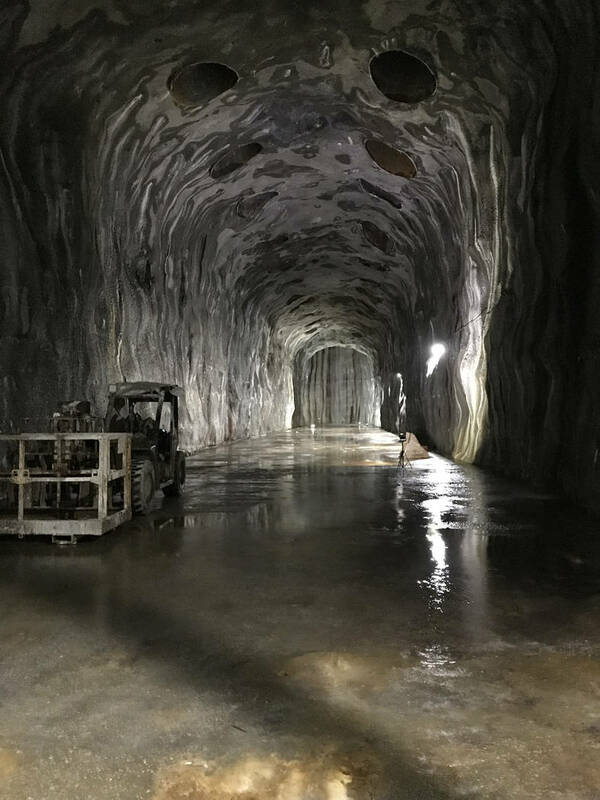 To access that intake, crews have been working for the past three years on the low level pumping station that includes a cave, or forebay, 500 feet underground that is expected to be flooded next week as underground work wraps up, said Erika Moonin, project manager for SNWA. As they worked, three pumps have been working round the clock removing about 500 gallons of water per minute out of the cave. Groundwater, some of it warmed by geothermal pockets, drenches the area by waterfalls, rainlike drops and fountain spouts and seeps in through drain holes that help equalize the pressure so the structure doesn’t collapse. The cave, 377 feet long by 36 feet high by 33 feet wide, will fill at the same rate when the pumps are turned off. Once filled, in about three or four days, a remote-controlled submarine will be used to unscrew the bolts from a 30,000-pound, 16-foot-round bulkhead that will connect the station to the 3-mile long intake tunnel. “There aren’t very many projects like this in the world,” said Jordan Hoover, project manager for Montana-based Barnard Construction Co., the general contractor for the pump station. Despite Southern Nevadans reducing their water use by 36 percent since the drought began, Moonin said project is necessary so they have continued access to the lake, which provides 90 percent of the water for Boulder City and the Las Vegas Valley. 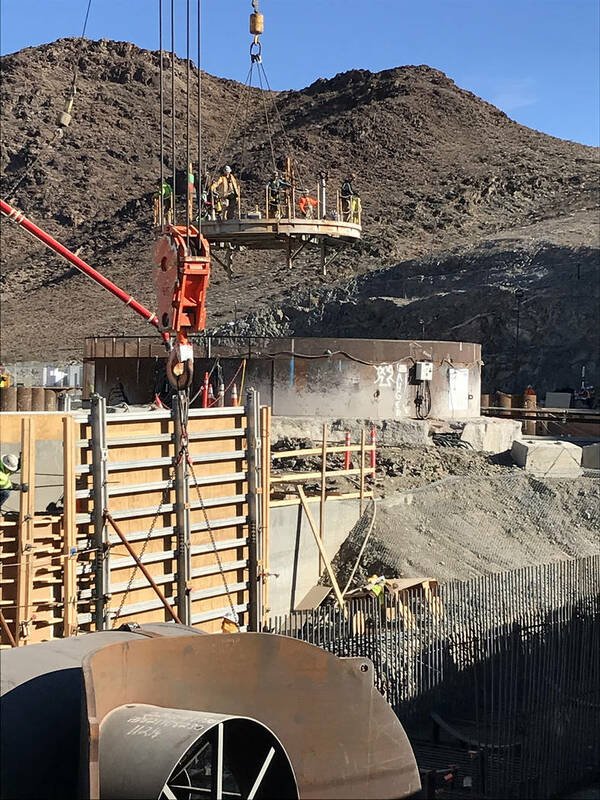 Bronson Mack of SNWA said the new pumping station, which is scheduled for completion as early as 2020, will be put into use when the lake’s level drops below 1,000 feet and can continue to supply water to thirsty Southern Nevadans to a depth as low as 875, 20 feet below the “dead pool” level when water can no longer be released downstream for use in Arizona, California and Mexico. Sixteen of the 32 pumps have been delivered so far. “We have to stockpile them because it takes twice as long to manufacture them as to install them,” Moonin said, noting the first of them should be installed sometime in February. The construction crew is also hard at work on an electrical and maintenance building, a dedicated, 65-megawatt electrical substation and a pair of 12-foot-diameter pipes connecting the pumping station to the community’s two water treatment plants. Just as it takes more than a single drop to become a significant body of water, the combined fees of the authority’s water users are being used to pay for the $1.35 billion cost of the third intake and low level pumping station at Lake Mead. Mack said the project received no federal or grant money and is funded entirely by water rates and fees. In Boulder City, the service charge for SNWA varies depending on meter size, but accounted for about $12.40 per month in fiscal year 2017-2018, said Lisa LaPlante, Boulder City’s communications manager. Recent hikes in water rates has increased that by about $2 per month. Review-Journal staff writer Henry Brean contributed to this story. Contact him at hbrean@reviewjournal.com or 702-383-0350. Amount of water a day the new pumping station will be able to pull from Lake Mead. The lake level from which the authority will be able to draw water using the new station. The surface of the lake currently sits at about 1,079 feet above sea level. The authority’s two existing pump stations can’t pull water from below the 1,000 foot mark. The cost of the new station, which is on schedule for completion in 2020. The cost of the complete pumping station and third intake project.